A rare open space in the Canadian bush. This was indeed wild country. We followed grizzly bear trails. There were no human trails or tracks, no quaint abandoned cabins, old fire pits, etc. I found the hiking quite difficult in places. We crossed big windfalls, overflow swamps, cliffs, Devils Club, wet slippery boulder fields. 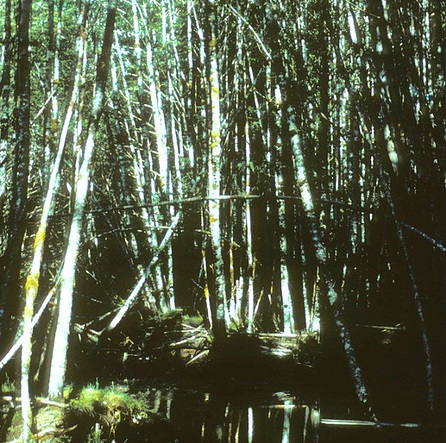 Especially trying: the dense alder thickets. And always the mosquitos. That was Day 1. We'd managed five miles. Day 2: More thrashing and cursing. Day 3: More thrashing and cursing…." In the photo above, my 45 pound pack is squatting there next to my knee. My husband’s 75 lb. pack is behind me. We were going in for at least three weeks, carrying climbing and snow camping gear plus extra food to cache in case we got stormed in. So we had two more packs, not seen in the photo above. We relayed them. That meant that on the way in, we "thrashed and cursed" over every inch of the route three times. Left, a portion of an overflow swamp along the river. Until about 8 PM each evening, the water here grew steadily deeper and the footing more treacherous as the glacial runoff increased.